142 MMS December 2016 mmsonline.com MODERN EQUIPMENT REVIEW Spotlight: Machining Centers control and the included CAMplete TruePath software enables analysis, modification, optimi- zation and simulation of five-axis tool paths in an integrated 3D environment. Methods Machine Tools Inc., call 877-668-4262 or visit methodsmachine.com. 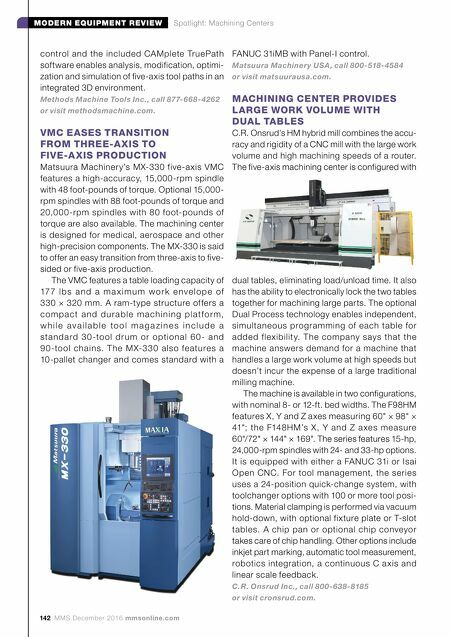 VMC EASES TRANSITION FROM THREE-A XIS TO FIVE-A XIS PRODUCTION Matsuura Machiner y's MX-330 five-a xis VMC features a high-accuracy, 15,000-rpm spindle with 48 foot-pounds of torque. Optional 15,000- rpm spindles with 88 foot-pounds of torque and 20,000-rpm spindles with 80 foot-pounds of torque are also available. The machining center is designed for medical, aerospace and other high-precision components. The MX-330 is said to offer an easy transition from three-axis to five- sided or five-axis production. The VMC features a table loading capacity of 17 7 l b s a n d a m a x i m u m w o r k e n v e l o p e o f 330 × 320 mm. A ram-type structure of fers a c o m p a c t a n d d u r a b l e m a c h i n i n g p l a t f o r m, w h i l e a v a i l a b l e t o o l m a g a z i n e s i n c l u d e a s t a n d a rd 3 0 -to o l d r u m o r o pti o n a l 6 0 - a n d 9 0 -tool chains. T he M X-330 also fe ature s a 10-pallet changer and comes standard with a FANUC 31iMB with Panel-I control. Matsuura Machinery USA, call 800-518-4584 or visit matsuurausa.com. MACHINING CENTER PROVIDES LARGE WORK VOLUME WITH DUAL TABLES C.R. Onsrud's HM hybrid mill combines the accu- racy and rigidity of a CNC mill with the large work volume and high machining speeds of a router. The five-axis machining center is configured with dual tables, eliminating load/unload time. It also has the ability to electronically lock the two tables together for machining large parts. The optional Dual Process technology enables independent, simultaneous programming of each table for added flexibilit y. The company says that the machine answers demand for a machine that handles a large work volume at high speeds but doesn't incur the expense of a large traditional milling machine. The machine is available in two configurations, with nominal 8- or 12-ft. bed widths. The F98HM features X, Y and Z axes measuring 60" × 98" × 41"; the F148HM's X, Y and Z a xes measure 60"/72" × 144" × 169". The series features 15-hp, 24,000-rpm spindles with 24- and 33-hp options. It is equipped with either a FANUC 31i or Isai Open CNC. For tool management, the series uses a 24-position quick-change system, with toolchanger options with 100 or more tool posi- tions. Material clamping is performed via vacuum hold-down, with optional fixture plate or T-slot tables. A chip pan or optional chip conveyor takes care of chip handling. Other options include inkjet part marking, automatic tool measurement, robotics integration, a continuous C a xis and linear scale feedback. C.R. Onsrud Inc., call 800-638-8185 or visit cronsrud.com.